The start of autumn signifies the beginning of the holiday season and brings along with it wonderful sights and smells. Capture seasonal elements and add details to your home to create a warm and inviting atmosphere for the holidays. The start of autumn signifies the beginning of the holiday season and brings along with it wonderful sights and smells. Capture seasonal elements and add details to your home to create a warm and inviting atmosphere for the holidays. Read on to learn simple ways to get your home decorated for fall! Tuck away your lighter weight cotton and bring on the thick knits and lush velvets! Add a plaid blanket to your armchair and introduce holiday colors with minimal effort. 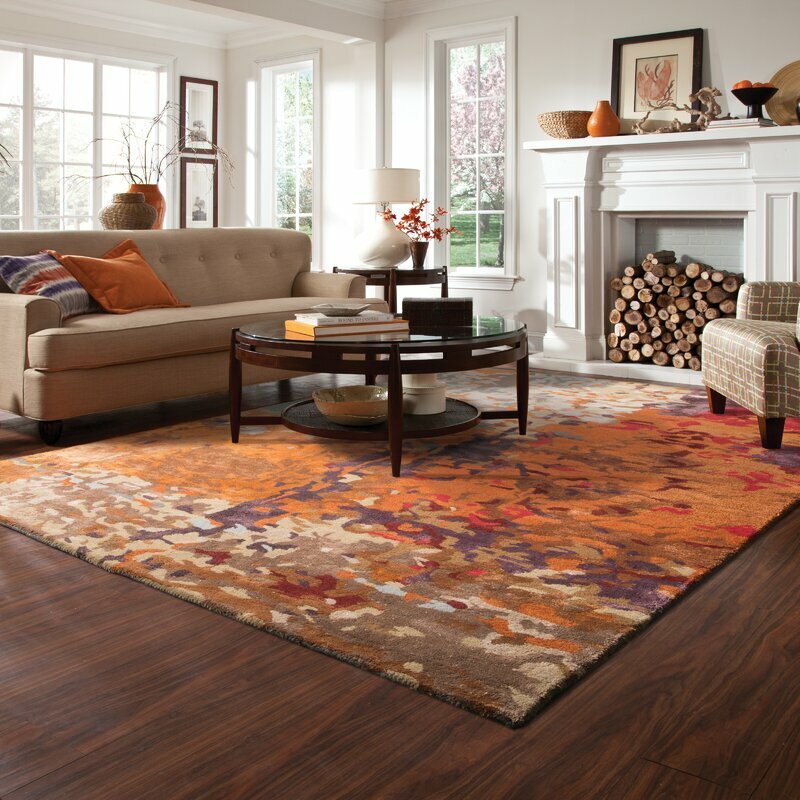 Consider switching out your lighter colored rugs used in the spring and summer for a warmer toned area rug. The darker theme lends itself to the warm tones of the season. Not to mention, you won't have to worry about house guests tracking in dirt. Perhaps the quickest and easiest way to liven up your space for the fall is adding a few seasonally appropriate throw pillows! We offer pillows covers individually or with inserts, so you have the option of reinventing the pillows you already have – or adding a few new ones! This Golden Art throw pillow is perfect for updating your couch, and with the glitzy gold details, it’s pretty enough to stay there through the New Year! Don’t overlook the bathroom for a little seasonal update! Sort through your linen closet and donate old towels to your local animal shelter. Then, get to work choosing how you will reinvent your space! A luxe berry tone mirrors the beautiful leaves outside. Darker shades also work well with guests visiting, as a light color will lose its vibrancy quickly. An added benefit – a rich red can last you the whole holiday season, so your Christmas quests can bathe in luxury as well! An inexpensive way to add the beautiful smells of the season to your home is to simmer homemade holiday potpourri all day on your stovetop! Your home will smell like the fall in no time by combining cinnamon sticks, orange wedges and a few drops of vanilla extract. To add more of a décor staple (not to mention save time!) pick up a colorful candle! These rich smelling candles bring the aroma of fall indoors and look chic on your coffee table or shelf. Consider picking one up for someone special – and one for you, of course! If you have been eyeing those stunning bar carts on Pinterest, now is the time to set one up for yourself! Be sure to include various kinds of liquor to appeal to a wide variety of tastes! Gin, vodka, rum and whiskey are considered standard options that work well with various mixers. Don’t forget the wine! For guests who enjoy an adult beverage on the mild side, offer a mellow red wine. To add a bit of intrigue, serve in a wine punt glass! These unique glasses are re-purposed from wine bottles and offer a fun way to elevate your holiday décor. We offer a variety of colors, so you will be sure to find one that suits your holiday décor theme. Try new art on your walls displaying the colors and feelings associated with the season. This stunning piece of artwork will make your living space feel like a brisk walk in Paris. The warm touches of orange will tie in expertly with your other fall décor. No matter how you decide to decorate your space for the holidays, be sure to get started soon! Get your My Décor Center shopping cart filled early, as our Black Friday sale will be starting soon. All items are buy one get one 50% off, and as always we offer free domestic shipping. Take a peek at our ever-growing selection and find some inspiration to update your living space! Modern and Smart Kitchen Must Haves! 2019’s Hottest Home Trends – So Far! 2019: The Year of the Pendant Lamp?